Consider this sad but all-too-common recruiting scenario. Your firm is an exceptionally exciting place to work. You have great people, great leaders, great products, and to put it bluntly, every employee considers working there to be an amazing experience. But then here comes the rub. When an outsider attempts to find out about and experience that same excitement, it’s nearly impossible for them. I call this phenomenon “hiding the excitement.” It doesn’t matter whether the outsider is actively looking for a job or not, or even if they are a potential customer. When they do a Google search on your firm, visit your web or social media sites or read your job postings, all they find is dullsville! This sad experience is inexcusable. It should be easy for any outsider not just to read about, but to actually “feel” the excitement of working at your firm. Yes, many firms have nothing exciting to reveal, but to have a great deal of excitement and then to make it impossible to find it is simply in my view, criminal. How Do You Reveal the Excitement Of Working At Your Firm? One of the reasons why employee referrals are so successful is that your employees know the exciting aspects of your firm and they can authentically reveal them to others. Unfortunately, most corporate efforts to make the firm’s excitement factors visible are, to put it bluntly, a failure. But if you’re committed to revealing the excitement, here are some benchmark examples that illustrate how it should be done. Deloitte’s employee film festival — I’ve written and spoken widely about Deloitte’s justifiably famous “film festival” approach. At its core, much of what happens at Deloitte may appear, to an outsider, to be unexciting accounting. But the leaders at Deloitte wanted to reveal the real level of excitement at their firm. So, they challenged their employees to use their mobile phone camera to find and post on YouTube examples of their exciting moments within the firm. With their film festival, Deloitte made it extremely easy for any outsider to authentically “experience the excitement” at their great firm. “Zappos family” videos — the undisputed King of revealing workplace excitement is Zappos. Judging by its videos, you would think they had more parties and celebrations per employee than any firm on the planet. Among its videos, some are company made, while others are put together by employees. It is the benchmark firm because no matter what it does internally from paying new-hire trainees to quit, outside-the-box onboarding, or eliminating management titles, they openly and effectively share it in an exciting manner with the public. And as a result, even though Zappos is “just an online shoe store in Nevada,” almost everyone knows what it’s like to work there. 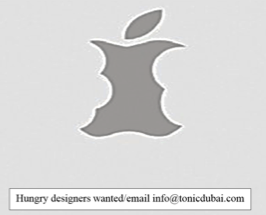 Tonic international “take a bite out of Apple” ad — what could be simpler: a picture of an apple with several bites out of it with nothing more than the phrase “designers wanted”? The picture provides an almost instant reaction that seems to infer that Tonic International is successful at competing at the level of amazing firms like Apple. Here is a facsimile of the ad. Everyone who currently works at your firm knows that it is exciting, but how do you reveal it to an outsider in a credible and authentic manner? Authentic videos can reveal the excitement — videos have the potential for being more revealing than any picture or set of words could be. The secret is to make sure that they are compelling, and that can only be assured after a great deal of thorough testing. Normally phone camera videos made by employees are considered to be the most authentic. The subject area of the video must cover work or the work environment that outsiders would consider to be extremely exciting. That might include impromptu employee celebrations after a business success, fun internal contests, and employees dancing or even lower-level employees interacting with senior executives. Adding a compelling tune or song can make a good video a great one. No one creates more or better fun videos than Zappos. TV and radio commercials make it easier to feel the excitement — TV ads might seem on the surface to be expensive, but they can have a high impact. For example, the compelling GE “Owen” series of TV commercials has had an amazing eight times increase in applications. These ads have succeeded in literally changing the image of a century old industrial firm to a digital company. Obviously, TV commercials will be professionally made, but they can become more authentic if you include compelling slogans and scenes showing workers having fun. In addition, they also usually garner a great deal of press coverage at no extra cost. Walmart has used them and even the staid Koch Industries revealed the freedom that they give their employees with an ad showing some employees riding motorcycles out in the wide open spaces. Radio ads can also be powerful and much more targeted, but without the video, the wording must be compelling. Pictures can make a contribution also — one picture is worth 1,000 words. Although a single picture is usually not as compelling as a video, not everyone has time to watch videos. Pictures of unique physical features like the slides that Google, YouTube, and Rackspace almost instantly send a message of fun and risk-taking. Pictures of your unique office building like those showing Amazon or Apple’s new headquarters can also send an instant message that things are different there. These pictures shouldn’t just appear on your corporate sites, but also on Pinterest and other sites that potential employees use when they post or view pictures. Compelling employee oriented phrases help send the message — well-crafted employee-oriented phrases and slogans can by themselves reveal the excitement of working at a firm. An outstanding example is The Container Store’s compelling phrases on its website, by themselves, effectively send a message the firm wants and rewards top performers. Read these quotes and see if they are not impressive: “1 Equals 3″ is our hiring philosophy.” One great person equals three good people in terms of business productivity. “We hire only about 3 percent of all who apply.” “If you indeed believe that with one great employee, you get three times the productivity of a good employee, you can afford to extensively train them and communicate to them, empower them and pay them 50 to 100 percent more than what other retailers might pay them.” “Our 1=3 employees … feel like owners of the company and strive to do what’s right for each other and our customers every single day.” Even revealing employee friendly policies (e.g. bring your dog to work) can help to show the excitement and the freedom. We “live our values” illustrative examples — it’s not enough to simply state that your firm has great values. Instead, you must make it easy for everyone to find and experience real examples of how you “live your values” every day. Clearly demonstrating that your company is involved in the community or that it supports sustainability. You can also reveal, as Rackspace contends, that it is different than the herd, which can be a powerful message to innovators. Day in the life profiles makes it easy to relate — offering video or narrative employee profiles can also be powerful. Of course, the profiles can’t appear to be scripted by PR and they need to include compelling work examples and fun features that others would desire to experience. And finally, the employees who you profile need to look and sound like the type of employees that you are targeting for recruiting. Links to other fun sites — firms can reveal their excitement by providing links to other interesting or exciting sites. They can be links to public service sites, charities, educational sites, or even fun sites (i.e. Star Wars) that most employees and targeted applicants enjoy. Links to awards that your firm has won and “best place to work lists” that your firm is on can also support your message of quality. A book about the firm — a book that reveals what it’s like to work at the firm can also be effective, especially if your CEO is famous (e.g. Tony Hsieh — Delivering Happiness). Podcasts, Twitter feeds, blogs, and recorded executive speeches can also have an impact on spreading the excitement. Why Do Executives Tolerate “Hiding The Excitement”? And to me, what is most surprising is that executives who work at exciting firms don’t even realize that the excitement is impossible to find, so they do nothing to eliminate keeping the excitement a secret. But they need to be made aware of the severe negative economic consequences that occur when you hide your excitement. At the top of the list is that you will get fewer highly energized high-quality recruits (and customers). Develop a “reveal the excitement metric” and periodically report to executives how easy it is for an outsider to find the exciting aspects of working at your firm. Finally, throughout the effort, your employees should be involved because they are the most likely to know about the wide range of compelling features at your firm. Identifying whether your firm effectively completely reveals its excitement is relatively easy. You simply have a handful of neutral outsiders review your recruitment and marketing materials and have them make a list of the average, above average, and the exciting WOW elements that they encounter. You can also have neutral parties do a Google search on your firm’s name as an employer to see if they can easily find your compelling features. Unfortunately, this type of simple market research often reveals that in 95 percent of the cases, there will not be a single WOW “take your breath away element” that after hearing it, visitors would then virally spread. In my experience, there are plenty of people to blame for hiding the excitement, starting with extremely conservative HR people, the risk-adverse in-house lawyers, the stick to the tried-and-true recruitment marketing firms, and the Nervous Nelly PR people. And I am not trying to be subtle here; you must minimize the role of these individuals, and instead rely on marketing people who know how to create WOWs. There is no more powerful long-term recruiting strategy than having a strong employer brand. But when crafting your employer brand, it’s a serious mistake to have a brand message that is so safe that it offends (or excites) no one. Instead, executives need to insist on erring on the side of excitement. Avoid the natural tendency to worry about “overpromising” and the supposedly legal consequences of doing that (which really only exist in the minds of lawyers). Instead, the superior approach is to be proud of your firm’s features and to widely boast about them. This is especially important because so many firms have little to sell, so if your firm is exciting, it’s simply a crime to keep it secret. It hurts your employees, the shareholders, and most of all the potential recruits that won’t explore your firm because you kept the most exciting elements a secret.